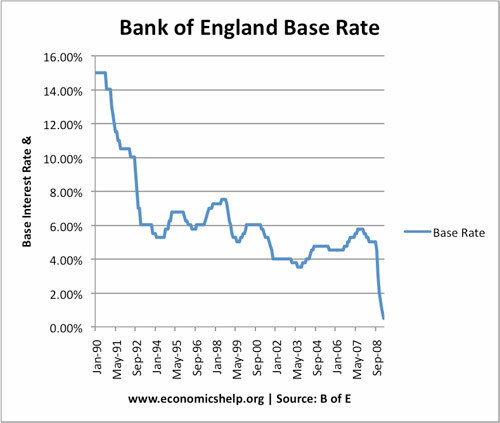 Between 1999 and October 2008, UK interest rates were remarkably steady. They varied from a peak of 6.0% in 2000 to a temporary low of 3.5% at the end of October 2008 - just before they were dramatically slashed. This represents an era of great stability and coincidences with a period of low inflation and steady growth. Monetary Policy looked pretty unexciting, and rates rarely varied by more than 0.25%. This apparent stability in interest rate policy of cause masked volatility in credit and housing markets. The effects of Quantitative Easing are yet to be Understood. Even the Bank of England have said the impact of money creation is hard to know at present time. On the one hand, many point to the scale of the recession and deflationary pressures. On the other hand others have pointed to the inflationary risk involved in creating money. The Banking crisis caught many off guard. Further reposessions and a prolonged recession could exacerbate bank losses and cause more economic turmoil. The UK Housing market plays a key role in influencing the economy. Prices have fallen significantly. The question is how much further will they fall? The worst of the recession is over. The effect of printing money, zero interest rates, low exchange rate and expansionary fiscal policy will cause an economic recovery and the end of deflationary pressures. Record levels of Government borrowing could create inflationary pressure. The impact of increasing money supply combined with a rise in economic activity and bank lending could cause a rapid rise in money supply and inflation. Quantitative easing is having limited impact because banks just don't want to lend given the state of their finances. UK house prices could keep falling another 20% to return house price ratios to long term trends. The recession is not yet over and unemployment is likely to keep rising which will diminish wage inflation and inflationary pressure. OK, time to stop sitting on the fence. - What do I think? Well, somewhere in between. But I believe we will have slow economic recovery which will create some inflationary pressure. But, I do think interest rates will rise to 3 or 4%. I think we will avoid the Japanese experience of zero rates. But, we live in uncertain times and there is an element of wait and see and then revise your forecasts. thus rates low for a while.